This is the twelfth in the series of ‘Let’s Educate the Judges’ in evaluating the exhibits of the Australian States Revenue and Railway Stamps. This paper is not a critique: it is written to guide the judge. 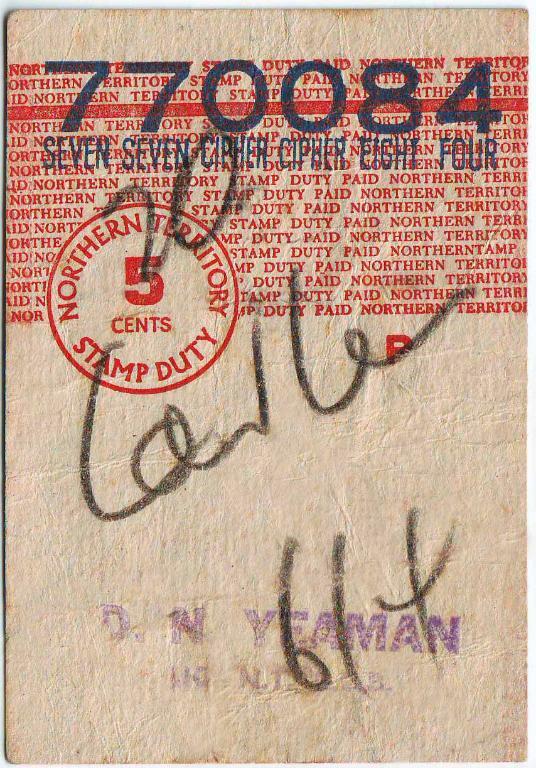 I offer my 40 years of knowledge collecting Northern Territory revenue stamps. When constructing an Australian revenue exhibit, there appears, from all states, to be a lack of usage on complete document, and the Northern Territory is no exception. Very little has come onto the open market in the last twenty years, and when found, the majority are cut-outs clipped from documents before destruction. The exhibit must show adequate usage with the correct rates. As revenue collecting strengthens there is less to go round and I am further predicting a major shortage of quality exhibition ‘pieces’. An exhibit without such ‘gems’ will struggle to do well. There is little reference available to the judge to ‘polish up’ on, and as in my previous papers, none are complete, some are wrong, some miss out a complete series, some have issues back to front and all are badly in need of updating. It is important for the judge to know all this before attempting to judge an exhibit. 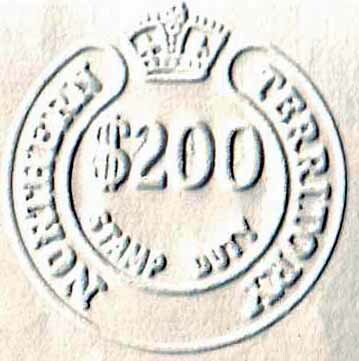 A good start is ‘The Revenue Stamps of the Commonwealth of Australia in its Territories’ by Bill Craig . The Cinderella Journal of Australasia has had several articles over the last 15 years. ‘Stamp News Australasia Revenue Review’ D. Elsmore is another source. I can find little else written. There may be the odd article in society journals that I have missed. I can only see a 1-3 frame exhibit being possible here, unlike my other papers I have included the decimal issues for completeness. The Northern Territory was annexed to South Australia in 1863. An agreement made in 1907 to transfer the Territory to the Commonwealth became formerly affective on 1 January 1911. From 1 March, 1927 until 12 June, 1931 the area was divided for administrative purposes into two territories. North Australia [Darwin] and Central Australia [Alice Springs]. 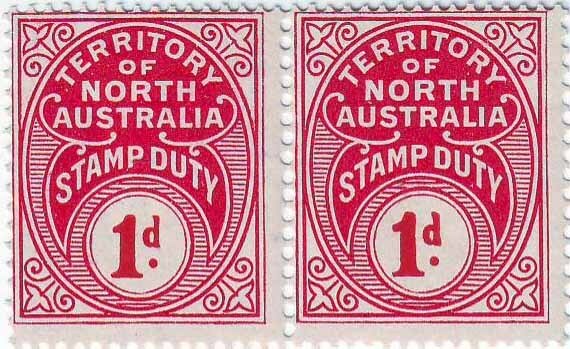 The use of Impressed and adhesive duty stamps began in 1917 under Northern Territory stamp ordinance 1917 to 1960. The Northern Territory acquired self governing status on 30 June 1978. Some Information in this paper was gleaned from Mr. Ronald Thomas Commissioner of Taxes of the Northern Territory. 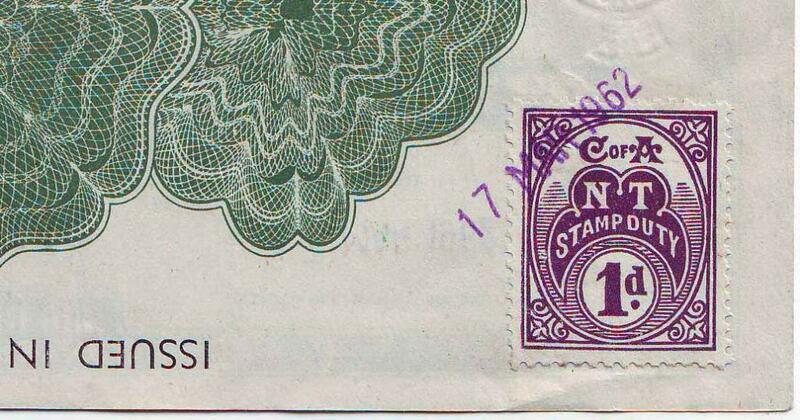 Adhesive Issues: The first series was issued October 1917c. I can find no record of any proofs in private hands. This series consisted of six values. The three highest values 5/-, 10/- and £1.00 [fig 1] in this series appear very scarce. It is recorded that only 30 sheets of each were perforated and issued, as it is not known how many were used. If a small selection from this series is shown, they should be appreciated by the judges. Usage is exceedingly rare. 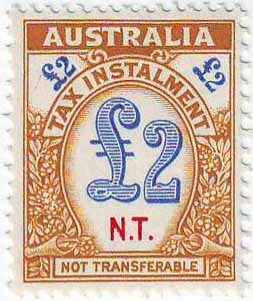 By 1929 a second series was issued, this saw a change in the legend from ‘C of A’ to ‘Territory of the North Australia’. Only three values are recorded in this series, 1d, [fig 2] 6d and 1/-. All three values appear scarce, although I have seen John Ash imprints of these values, and if shown, should be appreciated by the judges. Destruction by the note printing branch on 21 July, 1938 was undertaken of the remaining stock from this series. 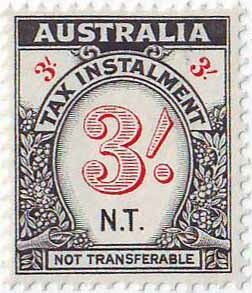 A third series appeared in 1936 showing a change of watermarked paper and perforation. This should be well explained by the exhibitor. 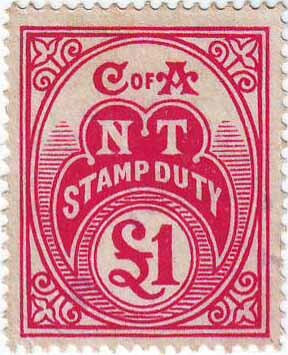 Three values being added to this series, 5/- 10/- and £1, all three appear scarce, usage [fig4] is rare as with the first and second series. Complete Travellers Cheque issued in South Australia and cashed in N.T. This series ran until decimalisation in 1966. The £1.00 from the first series appears to be the scarcest of all the pre-decimal issues. In June 1965 proofs of the 1¢ and 5¢ were supplied to the Department of the Interior. Subsequently 20c and $2.00 denominations were requested. 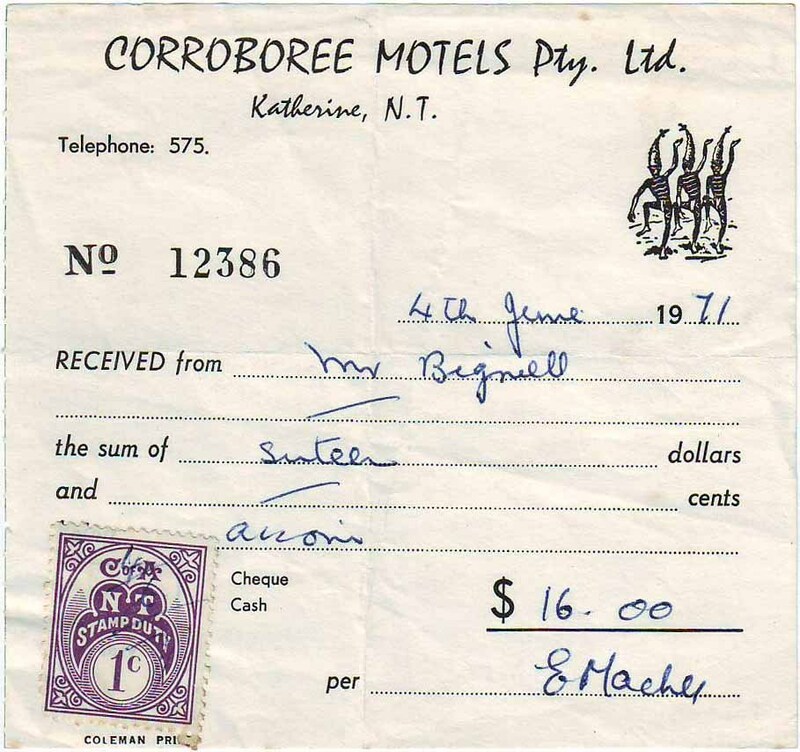 In September 1966 the Note Printing Branch advised that supplies of a $2.00 yellow could be delivered within one month, this should be well explained by the exhibitor. The first decimal series was printed in sheets of 100 and comprised of two panes of 50 5x10 with a vertical gutter between. 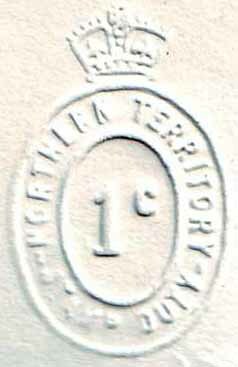 Imprint by the authority of the Government of the Commonwealth of Australia, C of A watermark continued with the change in perforation. Again this should be well explained by the exhibitor. Eight values from 1c [fig 5] to $5. This first series appears scarce although it had a 12 year run. Usage also appears scarce and if shown should be appreciated by the judges. A second decimal series was issued 30 June, 1978 with values added to $50.00. 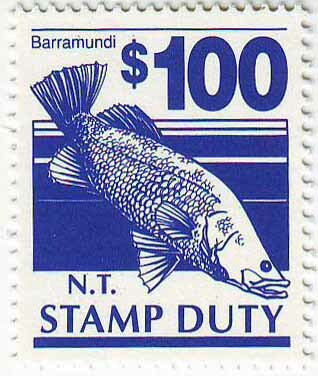 This series was locally printed on plain unwatermarked paper at the Government Printing Office in Darwin. 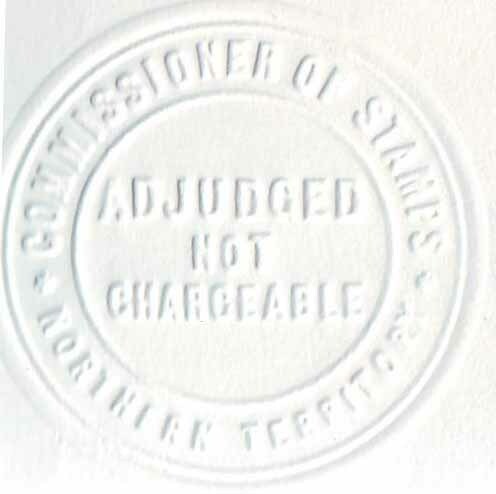 A complete presentation set exists [fig 6], over stamped Commissioner of Taxes and dated. A selection of this issue is more readily available and should be shown. Again usage is scarce. A final series was introduced in 1989c depicting local wildlife with a $50.00 showing a water lily. This series of six values to $100 [fig 7] was again printed local on unwatermarked coated paper perf 14. This series appears to be have been exhausted around 2007. 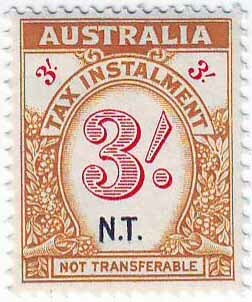 Commonwealth Income Tax: With the Commonwealth taking over the collection of income tax in 1941, purpose Tax Instalment Stamps with N.T. printed centrally on 29 values 1d to £2 [fig 8] were printed. Two colours in the 3/- [fig 9] issue exist and should be shown and explained by the exhibitor. Fifteen only unique die proofs of the frame colours are known. 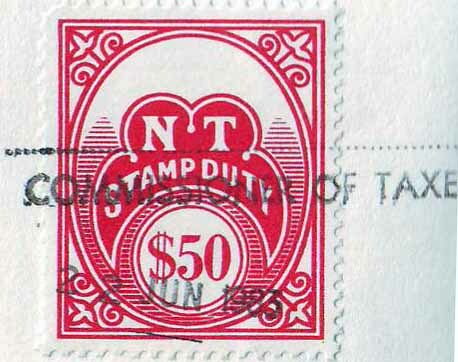 All issued stamps are available with mint being scarce but available. Usage is particularly rare and would be a plus if shown. Several essays exist which are exceedingly rare and if shown should be appreciated by the judges. Also known with part ‘CANCELLED’ showing one of these groups of letters CAN-CEL-LED [fig 10]. These are from printers booklets sent to interstate tax offices as reference copies, all are very rare, only one booklet is known in private hands. Revenue Stamped Paper: Betting Tax. Only one ticket has been seen with a value of 5¢ [fig 11]. This should be shown by the exhibitor along with any possible variants. Impressed Duty: There appears to be only one single colourless 1d value recorded between 1917 and 1966. 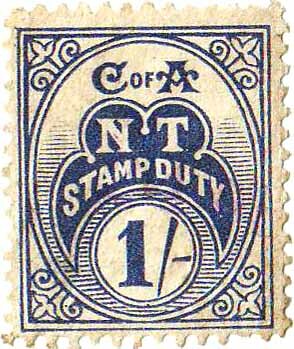 According to the stamp ordinance rates of duty were so low it is more probable that the use of adhesive duty stamps were permitted, although I have a 10/- value. An ‘Adjudged Not Chargeable’ [fig 12] has been recorded and if shown should be rewarded by the judges. A colourless decimal embossed series was issued 14 February, 1966. This consisted of 12 values from 1¢ [fig 13] to $200 [fig 14]. It is unknown if Northern Territory issued Toll Tickets or Wine and Spirit Revenues so there is scope for further personal research. Write critiques to help the exhibitor further his exhibit. Straight negative critiques are unhelpful at the best of times.